Beverly Hills, popularly known by its zip code 90210, has been home to popular celebrities that’s why when you hear of the place, luxury comes to mind. Even the events are extravagant — the Beverly Hills Wine and Food Festival collaborates with prestigious sponsors to offer the taste of selected wines, liquors and beers as well as the makers of extravagant products. Beverly Hills has a warm Mediterranean climate. 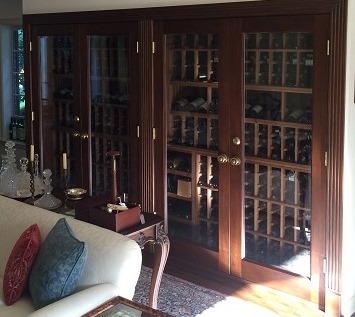 If you have a wine collection, you would really need a wine cellar refrigeration installation. A climate controlled wine cellar needs a refrigeration unit that is of the right size and quality. Wine cellar cooling system Beverly Hills will give your wine collection the setting it needs for the optimum aging and storage environment and the proper temperature and relative humidity levels as well even with the town’s climate. Wine cellar refrigeration is one of the most important aspects that your wine collection needs. 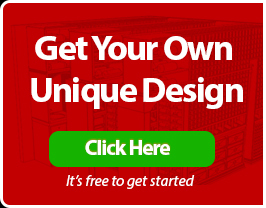 When deciding on a cooling unit, you have to be certain with the design and construction. Trust only the most reputable manufacturer because sub-standard and undersized refrigeration units can cause you harm along the way. One of US Cellar Systems trusted and most reliable partners when it comes to climate controlled wine cellar designs and wine cellar refrigeration installation Beverly Hills is M&M Cellar Systems. It is a California-based company, well-known for their HVAC refrigeration and heating installations as well as good customer service and proper cooling unit maintenance. One of M&M Cellar Systems projects was a wine cabinet specifically designed for cooling small wine storage areas. 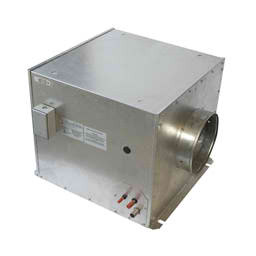 It was engineered to give the proper amount of circulating air into the narrow-spaced storage. It is more commonly known as a High Static (HS) System. HS Systems are specifically manufactured with a design that will provide cooled air from medium or high-temperature spaces. They are also designed with a split-type refrigeration system. It has very powerful evaporators that it is possible to install it as far as 25 feet from the cooling room. These ducted wine coolers transport cool air to the wine storage room via ducts, which frees your storage room from noise and space compared to an in-room evaporator. The HS models use the refrigerant R134a with a total evaporator capacity of up to 20,000 BTU/hour. A wine cellar refrigeration installation Beverly Hills was done in a residence’s living room. 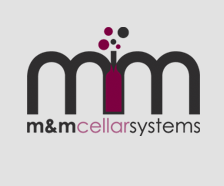 M&M Cellar Systems initiated the installation of a split-type wine cellar cooling system which has two major components: the evaporator and the condenser, coil and compressor. Specifically, the HS 6600 wine cellar cooling system was installed and was done by Mario Morales. He owns M&M Cellar Systems and also acts as the company’s lead technician. The HS 6600 model also includes piping sets for moving liquid or gaseous refrigerant into the wine cabinets. Mario was sure that HS 6600 was the perfect wine cellar cooling unit to be installed because of the room’s specifics, dimensions, type and location of construction. 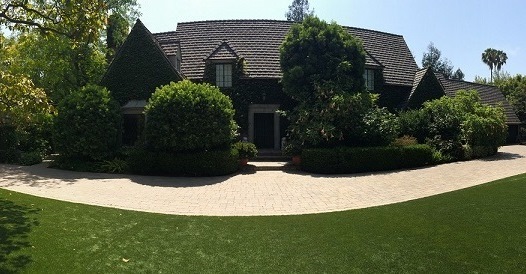 The wine cellar cooling system Beverly Hills was also charged with a refrigerant, Freon, which is commonly utilized for air conditioning. Moreover, Mario conducted a pressure test for the climate controlled wine cellar after charging it with Freon to make sure that there are no leaks inside and out and to ensure that the wine cellar refrigeration installation can handle the pressure declared by the climate controlled wine cellar manufacturer. This wine cellar cooling system Beverly Hills is just on of M&M Cellar Systems’ many refrigeration solutions to 90210’s warm climate. 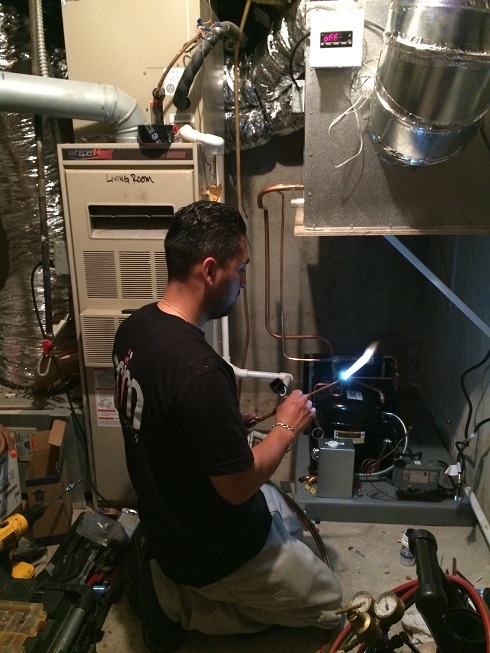 As the owner, Mario takes pride in his company’s good customer service in addition to its high quality of work. So for your wine cellar cooling needs in Beverly Hills and in L.A., trust only M&M Cellar Systems.